In brief: With the 2020 Summer Olympics just over a year away host city, Tokyo is looking to robotics to assist event goers and crews. The city’s Olympics’ Organizing Committee has initiated the Tokyo 2020 Robot Project, which seeks autonomous helpers from various companies. So far, only Toyota and Panasonic have signed on to the project. Toyota has two robots that will make an appearance at the 2020 Olympic Games. The first is its Human Support Robot (HSR). This automated helper will assist disabled spectators in finding their seats. It moves on wheels and has a single arm for grasping things. Presumably, it can be programmed to take and scan tickets to determine where to lead the person. The second entry is Toyota’s Delivery Support Robot (DSR). The DSR does pretty much what one would expect — deliver things. Specifically, the bot will be tasked with taking disabled guests refreshments which can be ordered via a tablet. The DSR will be loaded with snacks per order and bring them to the user’s location. The HSR will then help the attendee by unloading and handing over the items. The Japan Times notes that up to 16 HSR and 10 DSR will be in operated by several people. This suggests that perhaps the robots will not be completely autonomous. It is unclear how much human support the robots need themselves. Panasonic’s contribution is called the Atoun Model Y and is not so much a robot as it is a partial exosuit. It will help Olympics’ staff members with lifting, carrying, loading and unloading at the event. The suit weighs about 4.5 kilograms, which is very light as exosuits go. Panasonic claims that the device will reduce lower back strain by 10 to 40 percent. 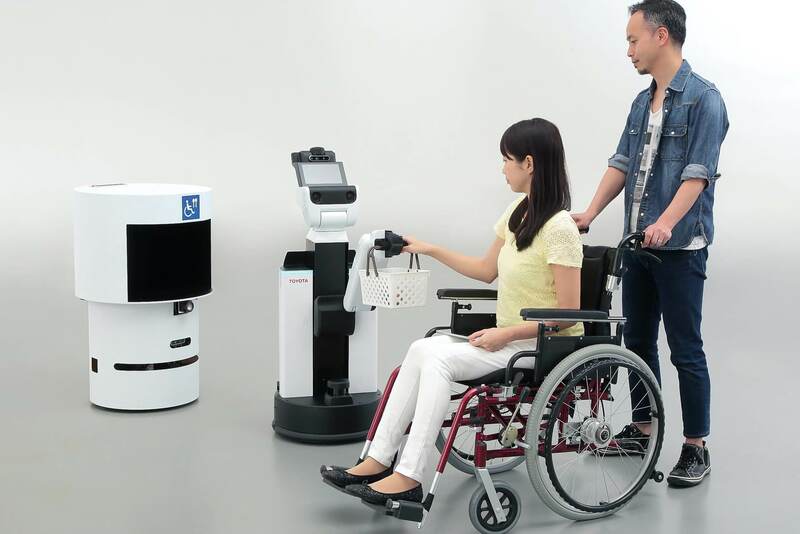 “[We want robots that are] friendly to people for the games and enhance convenience at events, as well as provide the audience with a new experience,” said Massaki Komiya, the organizing committee’s director general. The committee hopes that it will be setting a precedence for futures Olympic Games and other events to follow. So far, the robots seem more novel than useful, but who knows what other groups have to offer. No other companies have signed on yet, but then the project was only announced last week. Tokyo 2020 promises more details as the project expands.